Davis & Ceriani was founded in 1978 by Rick Davis and Gary Ceriani with a friendship and philosophy that has always placed the long-term interests of Davis & Ceriani’s clients first. The year prior to founding Davis & Ceriani, Mr. Davis obtained the first Colorado verdict of more than one million dollars in a personal injury case. Over the years, Mr. Davis developed a thriving business representing national and locally prominent developers, residential and commercial builders, lenders and investors at every stage of real estate acquisition and development and litigated numerous real estate and business-related disputes. He is responsible for the development and implementation of the legal framework for several well-known residential and commercial projects in the Denver metro area. Mr. Davis, now retired, was an excellent transactional and trial attorney, a rare combination. 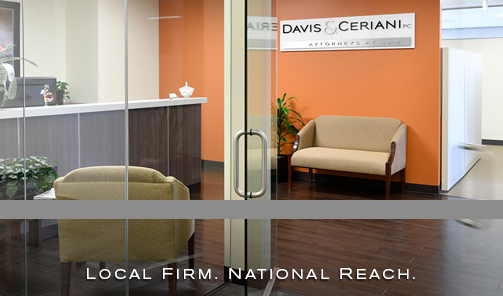 Over 30 years at Davis & Ceriani, Mr. Ceriani has gained a national reputation, and developed a national practice in complex commercial litigation. He has tried in excess of 100 cases to verdict and obtained two jury verdicts in excess of $20,000,000. Mr. Ceriani’s and Mr. Davis’s extensive experience, dedication to excellence, and their client-first philosophy remain the foundational core of Davis & Ceriani today. On the litigation side, this philosophy drives us to help clients make decisions based not on the emotion of today, but on a calm and reflective evaluation of the long-term costs and benefits. On the transactional side, we focus not just on getting a particular deal done, but on helping the client assure that the deal furthers the client’s global business plan. Davis & Ceriani’s trial team knows what is necessary to fully plan, prepare for, and then actually try cases which cannot be otherwise resolved. We know that the best way to achieve an acceptable settlement for our clients is to approach each case as if it will actually be tried from the moment the client walks in the door. That preparation—and our reputation of embracing, rather than fearing, the trial process—generates the kind of settlements that satisfy clients. Our job is to help our clients understand the risks and rewards of particular transactions so that they can make informed and intelligent business decisions. We promise our clients diligence, experience and attention to detail in order to make deals happen. For our employment law clients, both employers and employees, our extensive knowledge of the law and our compassionate outlook (since most of us spend more time where we work than anywhere else), ensure that, whatever the issue, we will handle it with care. Unlike many other firms, the fact that we represent both employers and employees gives us the unique ability to analyze each situation from both sides to work toward the best possible results.